The NBA is a league full of storied rivalries and unforgettable games, and this story is pretty unforgettable. Plus, it’s a fantastic example of what it means to be ABSOLUTELY POSITIVE – one of our Core Values here at Staples Marketing. Dominique Wilkins recently gave an interview for the Boston Herald wherein he discussed one of his first ever matchups with Larry Bird, during the 1982-83 season. Wilkins was a highly-touted rookie, but Bird had already established himself as a superstar – and a known trash-talker. 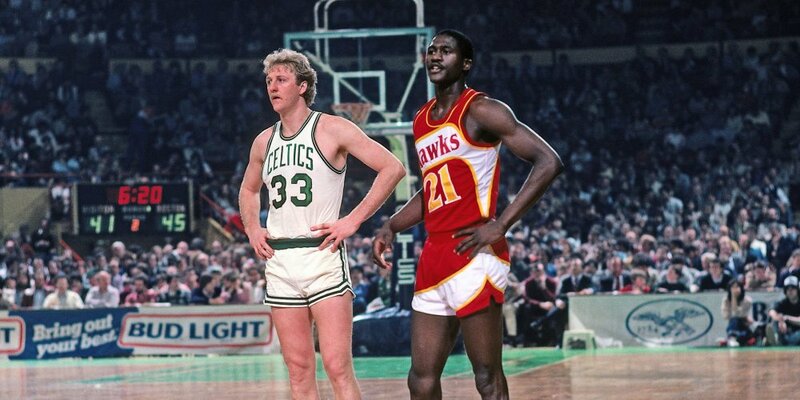 After refusing to shake Wilkins’ hand before the game, Bird proceeded to score on him time and time again, talking a HUGE amount of trash all the while. It wasn’t until Wilkins scored on Bird with a strong move to the basket that Bird finally relented (momentarily). Giving up 39 points to an opposing player is not great, but Wilkins chalked it up as a win because it wasn’t 40. Additionally, he went on in the interview to say that tough games against the league’s best competitors didn’t hurt him, but instead made him into a tougher, better player. Dominique Wilkins developed into a Hall of Famer because he didn’t let setbacks get him down, and he used the setbacks he met as learning devices to better prepare himself for the next time. That is what it means to be ABSOLUTELY POSITIVE.